In the opinion of many knowledgeable observers, the ruins at Palenque are the most beautiful Mayan ruins in the world. Especially in the theatrical light of a mist-shrouded morning, the ruins, set amidst a splendid tropical jungle, provide a haunting vision of an ancient civilization. Luckily for butterfliers, the same dense forest that harbored the ruins for so many years also is home to a staggering array of resplendently attired tropical butterflies. July/August is the peak time for species diversity. Day 1. The tour begins this evening at the Villahermosa airport, in the Mexican state of Tabasco. We will spend this night at a very comfortable hotel in Villahermosa. Days 2 - 8. An early morning drive on day 2, will bring us to Palenque, in the state of Chiapas. A comfortable and relaxing hotel (bring a bathing suit to enjoy its very attractive swimming pool) near here will be our base for the next seven days. Nights in Palenque. We have seen a number of interesting butterflies on the hotel grounds. Included among these were Chiapas Stripe-streak (Arawacus togarna)(each trip), Common Morphos (well-known to all), Yellow-fronted Owl-Butterflies (Caligo telamonius memmon), both Scallopped and Split-banded Owlets (Opsiphanes quitera and cassina) Tiger Heliconians (Heliconius ismenius), Doubleday’s Actinote (Actinote anteas), Sailor’s Lemmark (Thisbe irenea), Blue-gray Satyr (Mageuptychia libye) and Common Mimic-Skipper (Thracides phidon). Howler monkeys are resident on the hotel grounds and, for those who naturally rise at dawn, a long list of birds can be seen here as well. Even without looking we've seen Mottled Owls, Crimson-collared Tanager, Golden-hooded Tanager, Collared Aracari, Keel-billed Toucan, and an Agami Heron. As noted above, we will thoroughly explore the areas around the ruins for butterflies, including forest trails such as the Temple of Inscriptions Trail, where we have had great looks at the amazing Yellow-bordered Owl-Butterfly (Caligo uranus) (see the cover of American Butterflies, Fall 1995) and Almond-eyed Owl-Butterflies (Caligo brasiliensis). Probably about 500 species of butterflies can be found around the ruins! We won’t see them all, but we should see many. What is found here? Twenty-seven species of swallowtails, including Emerald-patched Cattlehearts (Parides sesotris); Common Melwhites (Melete isandra), which may be common; all four species of Mexican beautymarks (Costa-spotted Beautymark, Ancyluris jurgensenii; Blue-and-yellow Beautymark, Ancyluris inca; Sword-tailed Beautymark, Rhetus arcius; and Variable Beautymark, Rhetus periander) which are some of the most shatteringly beautiful butterflies in the world; Bate’s Emeraldstreak (Evenus batesii); eighteen species of heliconians, including Dot-bordered Heliconian (Heliconius doris) and Green Heliconian (Philothria dido). And that’s just for starters! Located deep in the Monte Azul rain forest, the ruins at Bonampak lie within one of the largest tracts of tropical rain forest within Mexico. While not nearly as extensive as the ruins at Palenque, paintings within the dark interior of the Bonampak ruins still maintain their startlingly vibrant colors from centuries ago (see photo on additional photos pages). The list of butterflies found here is even larger than at Palenque. Some possibilities that have been seen on previous trips include the intensely-colored Orange Kite-Swallowtail (Eurytides thyastes), Thick-bordered Kite-Swallowtail (Eurytides dioxippus), Dark Purplewing (Eunica alcmena), Tiger Beauty (Tigridia acesta), Musical Ghost-Skipper, and Great Bentwing (Ebrietas osyris). Blue-and-white Helcionians (Heliconius sapho) may be common. The list includes many species not yet recorded from Palenque, species such as the near endemic White Kite-Swallowtail (Eurytides salvini); Chiapas White (Perrhybris pamela); and Imperial Sunstreak (Arcas imperialis), the blindingly iridescent green namesake of Sunstreak Tours. About an hour's drive from Palenque, a series of impressive waterfalls and cataracts plunges through rich and humid foothills forest. 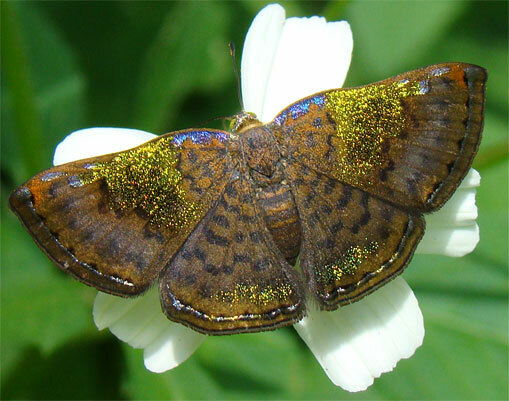 A series of trails through the forest provides possibilities for true forest specialties – Common Blue-Skippers (Quadrus cerialis) have been present on almost all trips so far – while paths and roads through the local Mayan village offer a wealth of more sun-loving species. Some spectacular species we've seen here include Yellow-trailed Swallowtail (Battus lycidas), shining iridescent blue in the sun, an absolutely sensational Hackberry Greenmark (Caria rhacotis), with shimmering golden-green iridescence and brilliant blue FW costal bars. The Mayans here are one of five groups of Mayans currently residing in Chiapas. Each group has its own culture, tradition and language. Most of the women of this group, the Chol group, wear identically patterned blouses that they make themselves. Located about 20 minutes from Palenque, Misol-Ha is a site with another waterfall, this one a single but very high fall. In the past, we have been fortunate to see good numbers of brilliant Blue-and-orange Eighty-eights (Callicore tolima) contrasting with bright red-and-black Yellow-rimmed Eighty-eights (Callicore texa). Small-eyed Sailors (Dynamine artisemia) and banners are possible, all while sampling the local pizza. We will spend some time in the Palenque area, keeping our eyes open for cordia flowers. These small bushes with non-descript flowers are hairstreak and metalmark magnets. All the bluemarks are possible as is the wonderful Sinuous Mottlemark (Calydna venusta). Crackers may be common and red-rings are always possible. At one location we were fortunate to see four species of preponas at the same spot! Skippers may be abundant. Recently, we found a Cafe-au-lait Hairstreak (Thereus lausus) a species previously unrecorded from Mexico. Day 9. This morning, we will drive back to Tabasco, to an area in the Tabasco interior where, along the river, a different butterfly mix is found. We have seen species such as Pink-checked Cattleheart (Parides eurimedes), Prison Metalmark (Hyphilaria thasus), Extroverted Theope (Theope pedias) and Broad-tipped Clearwing (Pteronymia cotytto) and have had a brown-skipper fest, seeing Radiant (Callimormus radiola), Comma (C. juventus), Yellow-veined (Virga virginius), Pasture (Vehlius stictomenes) and Frosted Brown-Skippers (Mnasicles geta). Night in Villahermosa. Day 10. The trip ends this morning at the Villahermosa airport. Cost of the trip is $3735/person from Villahermosa. Cost includes double-based accommodations, all meals (except, because of staggered arrival times, dinner the first night), ground transportation, airport transfers, tour leader fees and entrance fees. Not included are alcoholic beverages, laundry services, and other items of a personal nature. Single supplement is $425. This trip is limited to 8 participants.